Energy independence-minded homeowners can now have either “Liberty,” “Freedom,” or “Independence” installed on their roofs. 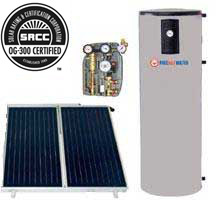 September 7, 2011 – San Jose, California Free Hot Water, a manufacturer and distributor of solar water heating systems, is pleased to announce that the Solar Rating and Certification Corporation (SRCC) has approved a total of 12 new OG-300 residential and commercial solar water heating systems manufactured by Free Hot Water. The certifications include 12 closed-loop solar hot water systems. All models now qualify for solar thermal rebates in California and many other states. In addition to the SRCC certifications, Free Hot Water also announced some memorable brand names for its three OG-300 lines. Kits that include Free Hot Water’s 4000 series solar thermal collectors are part of the Liberty line. Kits that include the company’s medium sized 5000 series collectors are part of the Freedom series. Finally, kits that include the company’s larger solar collector, the FHW-7000 model, are now part of the Independence line. As a result of the new branding, Free Hot Water’s national network of installers can now say that they install “Freedom,” “Liberty,” and “Independence” on their customer’s roofs. A storage tank with a solar heat exchanger. A pump station controller with temperature and pressure gauges, check valves, ball valves, fill and drain valves, and differential controller. Flashing for preventing roof leaks. Racking for flat or pitched roofs. Freeze Protection via a closed loop glycol system. Braces, bolts, and other hardware for the appropriate installation. The OG-300 pre-engineered kits contain either two collectors for small to standard homes, while others are designed with three or four collectors for larger homes or small commercial applications. Larger pre-engineered commercial systems are also available. In addition to the new OG-300 systems, Free Hot Water recently released the FHW 8000 series solar thermal collector, the company’s largest solar collector–and made in America. More informaiton is available here. All Free Hot Water systems include a 10-year warranty on Free Hot Water collectors, as well as limited warranties on other components. For more information about the new OG-300 lines or to browse the online catalog that includes over 1200 solar thermal and plumbing products, visit shop.freehotwater.com. Free Hot Water welcomes distributors, re-sellers, and dealers to Create an Account for fast and easy on-line pricing and shopping. Free Hot Water, based in San Jose, California, offers affordable, high quality hot water systems for commercial and residential applications. Our products and systems are clearly distinguished by their integrated design, quality, affordability, and ease of installation. 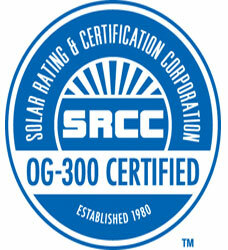 We feature our own SRCC OG-100 and OG-300 certified collectors and exclusive mounting and racking systems, providing high quality, reasonably priced, solar thermal solutions for your business or home. We’re also a manufacturer and distributor of a wide selection of superior quality pre-engineered systems. Our San Jose in-house engineering department specializes in designing solar thermal systems for a variety of large scale commercial applications. We evaluate each project, and design custom systems that are optimized for the unique needs of your business. Free Hot Water’s extra-mile customer service also includes submitting all documents necessary for permits and help to get you all applicable financial solar incentives.